Remember to sell your chametz ASAP. You can sell yours online here. You'll need to clean and "kasher" your kitchen and utensils to be usable on Pesach (some appliances and utensils can't be kashered). Click here for a guide to what can and can't be kashered for Pesach and how to go about it. Thursday night is time for some good ol' hide 'n seek- with bread. Have someone hide 10 pieces of bread (good idea to wrap them to avoid scattering crumbs) around the house (also a good idea to jot down where each piece is, in case you forget). 1) Grab a feather, wooden spoon, paper bag and candle and set out to find the 10 pieces (and any other chametz you might have missed). 2) Start with the blessing: "Baruch atah Adonai Elohaynu Melech ha-olam asher kid'shonu bemitzvotav vetzivanu ull biur chametz". 3) Collect all 10 pieces (and other loose chametz) and put it all aside for burning on Friday morning. 4) After the search and when burning chametz, say the "nullification" of chametz (basically: "Any chametz I've missed worthless to me"). On Friday morning incinerate the ten pieces and other chametz you don't plan to keep. You also may not eat chametz from mid-morning on Friday (Chabad.org can give you the correct times for your location). Firstborn boys (or the dads of boys under 13) should fast on the day before Pesach (Friday). That's to remind us that G-d spared our children when he killed the Egyptian firstborns. You can dodge the fast by coming to Shul in the morning to hear a "siyum" (conclusion of a tractate of Talmud), which is a reason to celebrate (and eat). We add "Hallel" (thanksgiving prayers to G-d) to the regular service on the first two nights of Pesach. On first night, have everything ready to go before you head off to Shul. That way, you can get down to business ASAP when you come home. 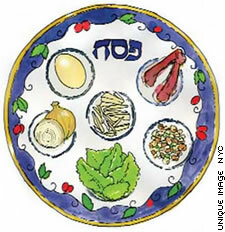 On second night, you may only start preparing for the Seder after Shabbos ends (so take it easy on Shabbos afternoon). Bone = roasted chicken neck with most of the meat removed. Egg = hard-boiled or roasted. Maror and chazeret = romaine lettuce and fresh horseradish. Charoset = ground nuts, apples/ pears & wine (pasty, not wet). Karpas = slice of raw onion/ parsley/ boiled potato. Each person says their own brocha for the wine, even if they don't say Kiddush. This is the first of the four cups. The person saying kiddush needs to include the Shabbos and Pesach sections. Wash your hands (three times on the right, three on the left). Dip the onion/potato/parsley into the salt water. Say Baruch... Borei Pri Ha'Adama and eat a little- just a little. Break the middle Matza in two. Put the larger piece away for the Afikoman. Leave the smaller piece between the other Matzos. Pour cup #2 and read the story of Pesach (Discuss its contemporary relevance). Say the normal Brocha for washing hands. Say the Brocha for Matzah (same as for bread), while holding 2½ Matzos in both hands. Say the special Brocha for Matzah (Boruch... al achilat Matzah), while holding only the top 1½ Matzos in both hands. Lean to the left and eat about 1½ Matzos (minimum 3/4 of a Matzah) from the top & middle Matzos. Try to finish this Matzah in 4 minutes. Say the special Brocha for Maror (Boruch... al achilat maror). Eat about three medium-sized Romaine lettuce leaves with some raw horseradish. Dip the Maror into Charoset. Eat 1/2 of the bottom Matzah with about three romaine lettuce leaves and horseradish. Dip the Maror into Charoses. Shake off the Charoset. Lean to your left while eating. Eat some of the boiled egg, dipped in salt water. This is also a great time to discuss the Pesach story and its modern message in detail. Bring the afikomen out of its hiding place and enjoy another 1½ Matzos (minimum ¾ of a Matzah). Pour cup #3 of wine as well as Elijah's cup. Sing the benching (grace after meals). After benching, drink the third cup, pour the fourth cup and open the door for Elijah. Praise G-d for all his miracles. G-d has accepted our Pesach Seder. On first day Pesach, we say a special prayer for dew. From 2nd night Pesach, start counting the Omer, 49 days of prep for Shavuot and the Giving of the Torah. The seven weeks of Omer-counting are a time for introspection and personal development.